Modern interior design for office space? – It can be dynamic, it can be fun, it can be modern, don’t doubt it. This project by Studio O+A proves it with its contemporary design; it’s urban and slightly bar-like emanation and with the playfulness of design arrangement. Bold colors, robust materials, and intriguing shapes adorn the rich variety of working premises. Created in close collaboration with the client the office design offers a fun scene that mashes together sci-fi and antiquity. Studio O+A: No projects are more inspiring than those created in collaboration with clients who love the design. As one of our confidential clients expands to new locations and new floors of its present location, each project becomes a blank canvas on which to explore a fresh theme. 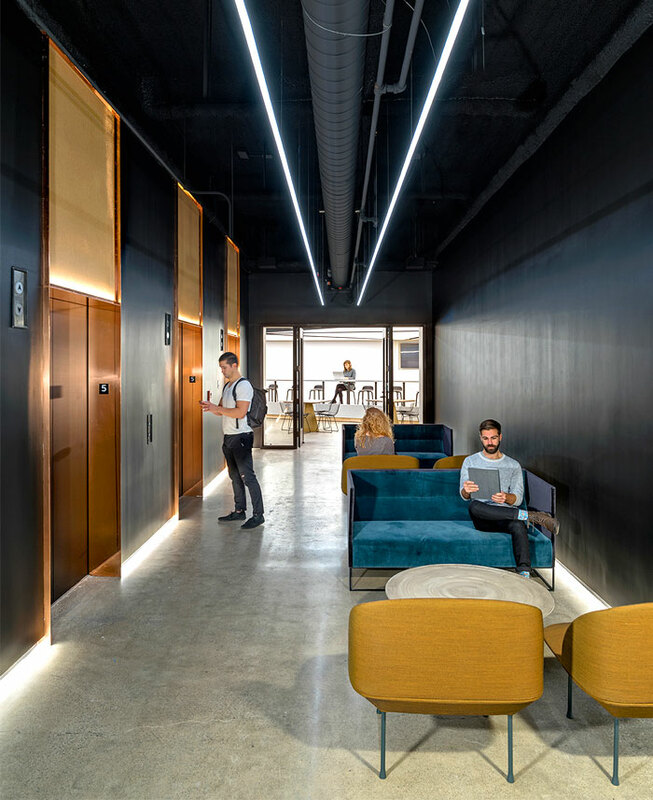 That theme for the 5th floor of this client’s San Francisco headquarters was Paris Meets Bladerunner—a high-concept tagline that became, in execution, a meditation on the layered transience of design. Starting with the city that many would judge the highest achievement of urban culture, we imagined Paris over a span of centuries (not excluding those to come) and created an office that mashes together sci-fi and antiquity. This 5th floor “Paris,” much like its counterpart in France, is an assembly of distinct neighborhoods, laid out as if for a culture of flaneurs, but overlaid with modern energy and drive.